Like bananas and oranges, melons come with their own perfectly compostable carrying cases. No grocery bags required, unless you’ve decided to add watermelon, cantaloupe and honeydew to this salad, in which case you’ll need to remember to bring your reusable shopping bag to the grocers or farmers market. After you’ve carved out the melon balls, use a spoon to remove the remnants of flesh still attached to the rind, then pulse the trimmings in the blender, strain and add the juice to the salad. 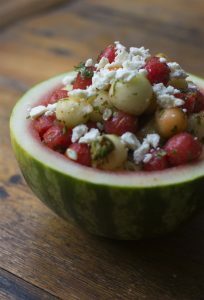 Christine Burns Rudalevige used watermelon, cantaloupe and honeydew melons in this chilled melon-chili salad, which she topped with feta cheese and served in a hollowed-out melon. Whisk together the lime juice, oil and honey in a large bowl. Add the melon, chili flakes and salt. Toss well. 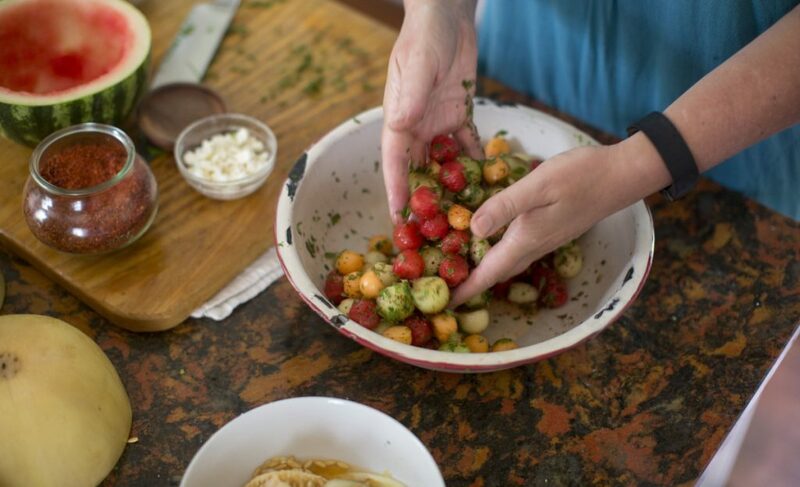 Sprinkle the melon with the cheese, pepitas and herbs. Chill for 30 minutes before serving.